The popularity of food science has been on the rise for years. From Modernist Cuisine to the ketogenic diet and everything in between, incorporation of technology into food preparation introduces a convenient and innovative approach to common dishes. Sous vide is no exception. What ten years ago was reserved for Michelin-star kitchens is now available in the home. 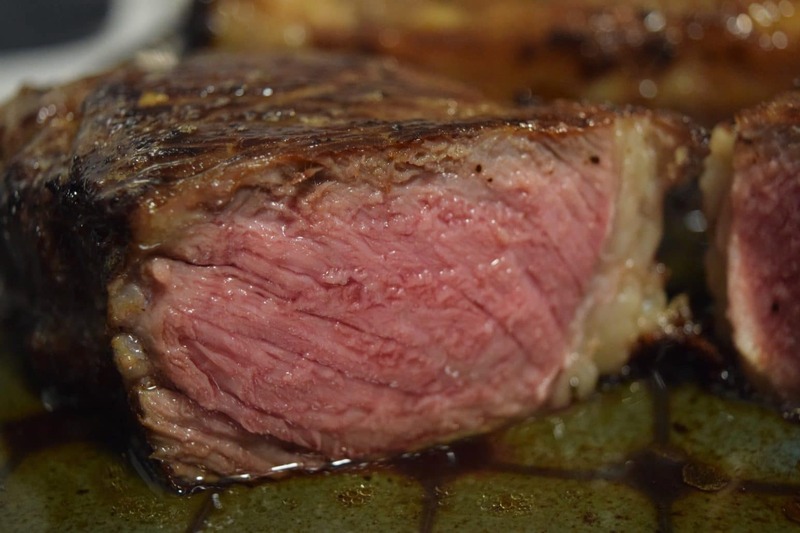 “Sous vide” is French for “under the vacuum”, and can be described as a cooking technique that utilizes precise temperature control with water to deliver consistent, restaurant-quality results. Cooking sous vide has always been a technological achievement, simplistic yet well ahead of its time. 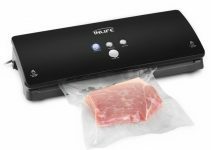 However, Mellow has stepped in to marry the technology and splendor of sous vide cooking with the convenience and user-friendliness of modern-day applications such as mobile device integration. The result is an efficiently-made, perfectly cooked, conveniently managed food preparation process. Read on for our in-depth review of the Mellow sous vide cooker. Make it to the end and you’ll get Sous Vide Wizard’s exclusive offer for $50 off this incredible revolution in home kitchen cooking. 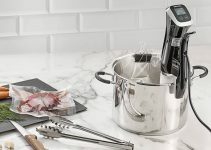 Mellow touts six new technological innovations in the sous vide space: refrigeration, weight sensing, wireless connectivity, energy efficiency, instantaneous feedback, and intelligent controls. Refrigeration: Mellow keeps food at the optimal temperature for freshness, waiting for the perfect time to begin the cooking process. This allows machine owners the freedom to go about their usual schedule, and return home to an already cooked dinner. Weight sensing: As soon as you place your water-compressed food into Mellow, the machine’s weight sensor takes over the process. 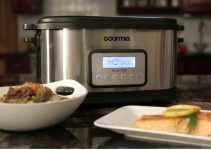 Intelligent technology cools the water bath and maintains a safe temperature until you decide the next step. 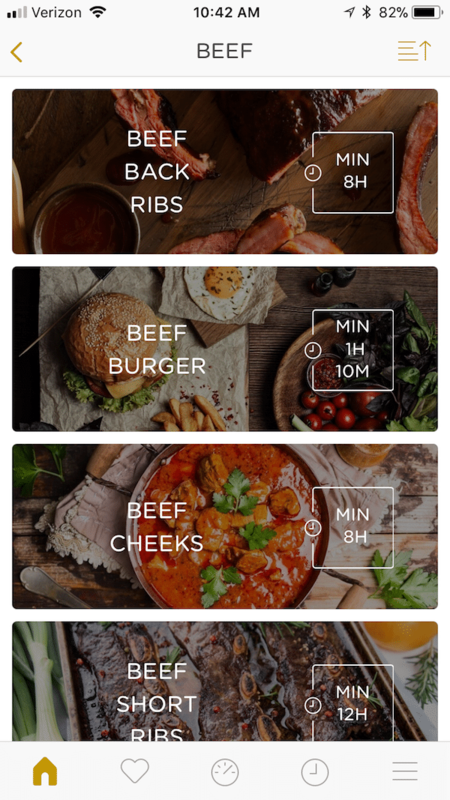 Wireless connectivity: Mellow has fast-reacting inbuilt Wi-Fi, allowing owners the ability to control their cooking process in real time. This can be performed via smartphone from inches away or miles from home. Energy efficiency: Mellow’s sous vide tank is double-walled, maintaining strong energy efficiency throughout the refrigeration and cooking process. Less heat escapes through the walls, and less energy is required to maintain a consistent temperature. 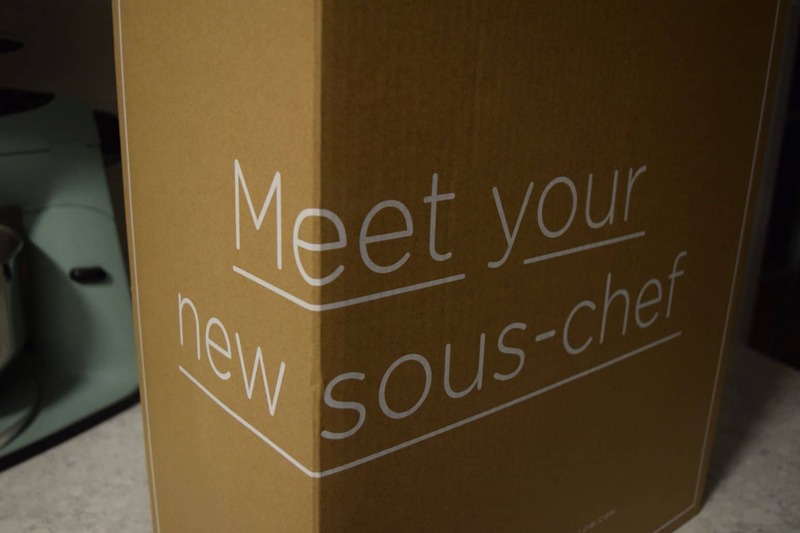 Instantaneous feedback: The Mellow sous vide machine provides feedback on a consistent basis. Post-completion, the app asks for feedback from the user as well, to custom tailor future cooking based on responses. 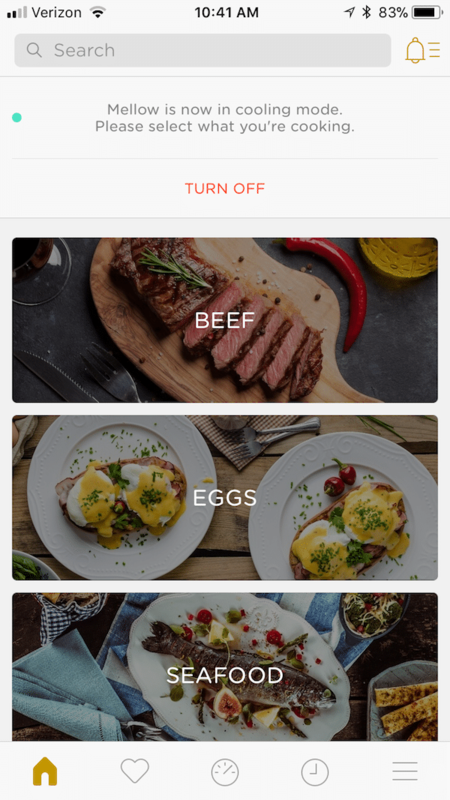 Intelligent Controls: Mellow is one of the most advanced sous vide machines on the market, and is controlled solely by your smartphone. There are no buttons on the machine itself, everything is on the phone, and the controls available are off-the-charts. 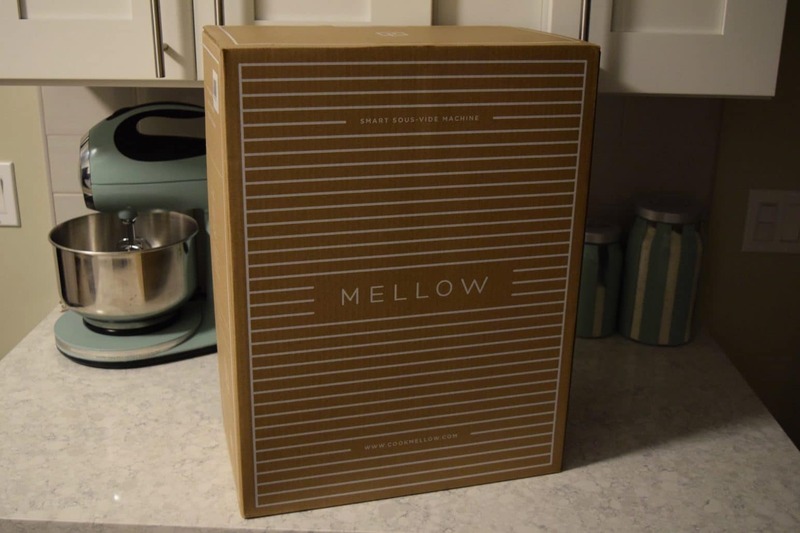 I was quite intrigued to find out what the hubbub was about revolving around Mellow. I contacted the company, and they sent a unit for testing purposes. Follow along with me! The box the Mellow came in was intimidatingly large. Extremely well-branded, the Mellow box continued their claims in large lettering: Meet your new sous-chef. 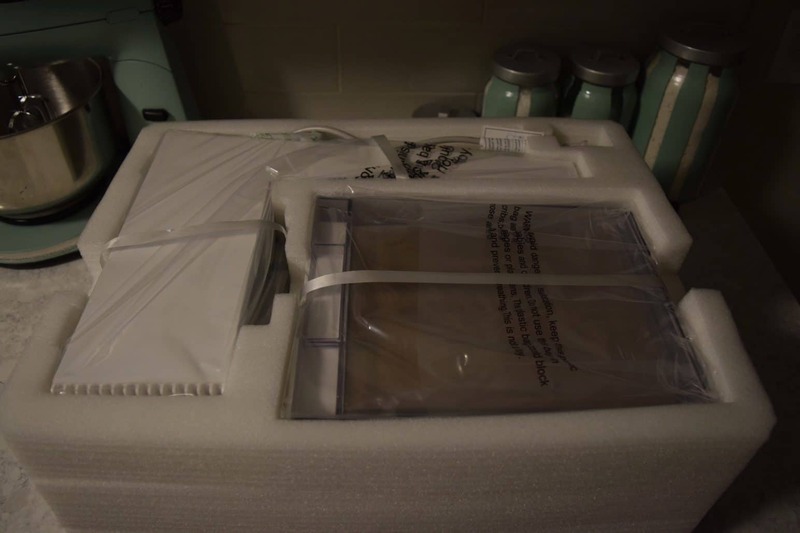 It was extremely tightly packed inside, encased with dense foam cut to the perfect size. 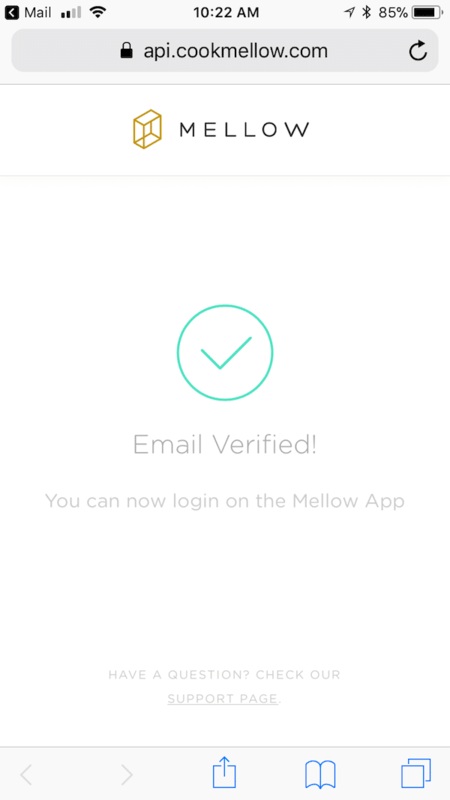 Download the Mellow App in the App Store or Google Play and create an account. Plug your Mellow into an electrical power outlet. 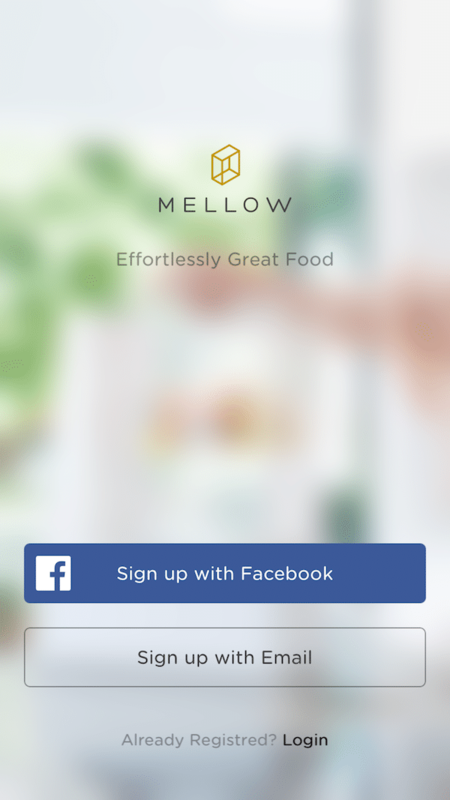 Follow the pairing instructions in the Mellow App. When you are ready to cook, fill the container with water and use the app to start cooking. 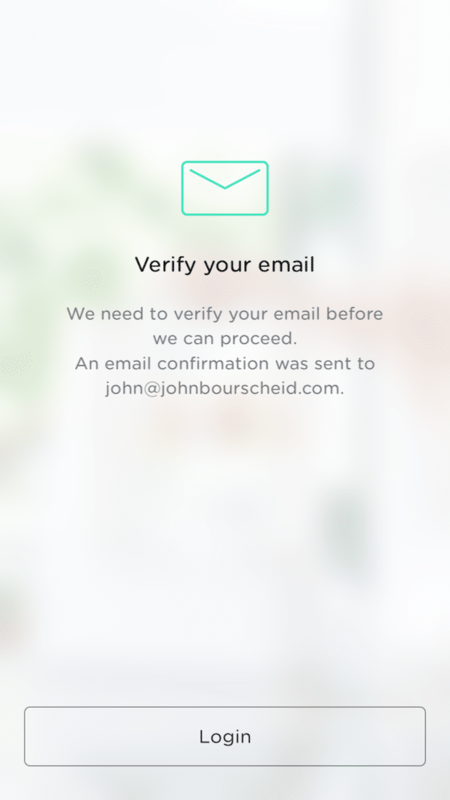 Once installed and verified, I was instructed to watch a quick, informational video, and was then able to connect the Mellow machine to the app. 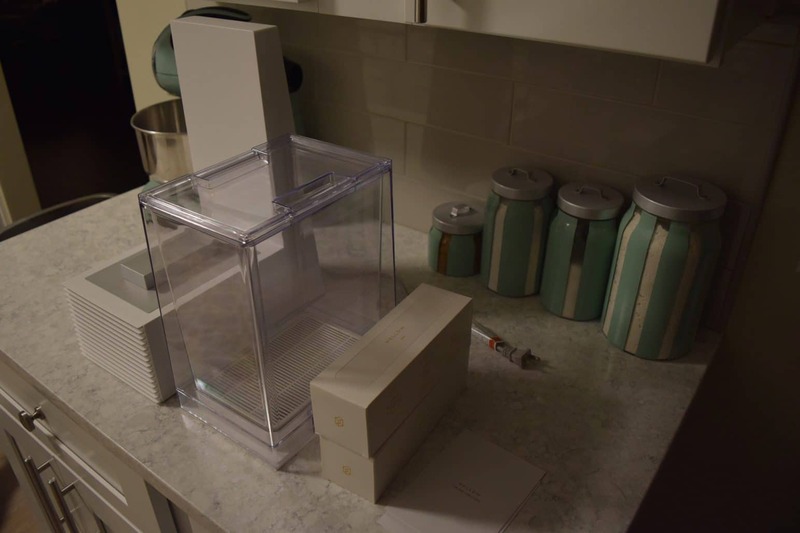 The process was unlike anything I had done before, and consisted of waiting for an orange light on the Mellow logo at the back of the machine to flash, and then touching my smartphone screen to the back of the sous vide machine for several seconds while they paired. After the devices paired together, I was asked to select some foods that I am most interested in, receiving a selection of three choices from beef, chicken, eggs, pork, seafood, turkey, and vegetables. I made my choices, and then began the actual cooking part of the process. 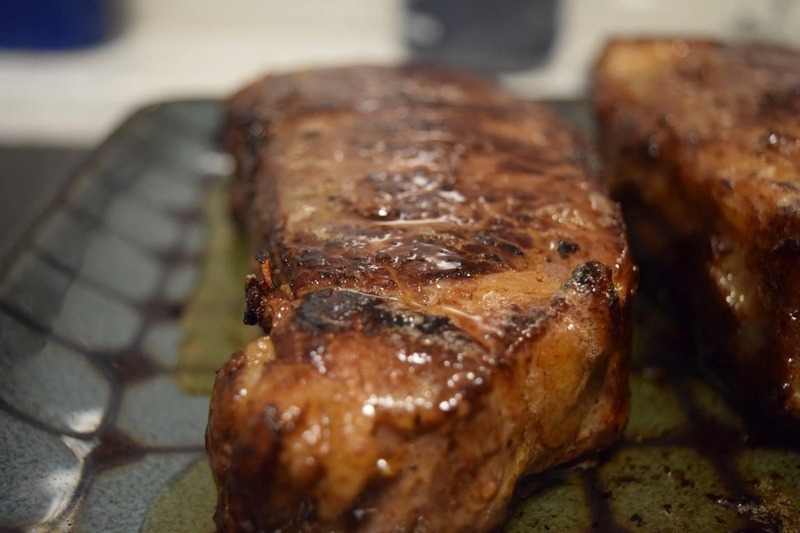 I had selected two beautiful New York Strip steaks of USDA choice quality for the initial test of the Mellow device. The steaks were about an inch and a half thick, and both had a relatively robust fat ribbon present. 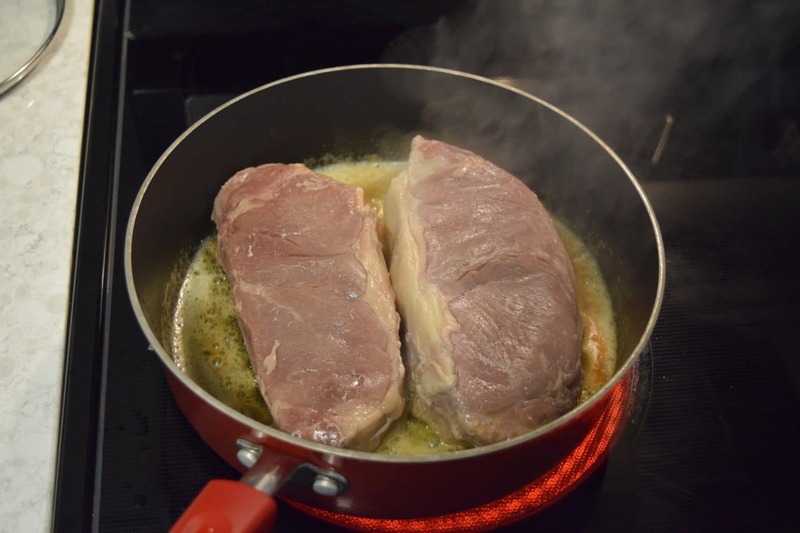 I thoroughly salted all sides of both steaks and let them sit to room temperature, ensuring that the salt properly absorbed and released into the steaks. Medium rare, thick steaks were always a bane of my existence. I estimate I have made them at least 100 times over the past few years, half of which on a cast iron pan (which led to a smoke-filled house and a center that was a little too raw for my tastes), the other half on a grill (which led to over-charred edges, a lack of buttery finish, and uneven overall cooking). I was ready for a solution. 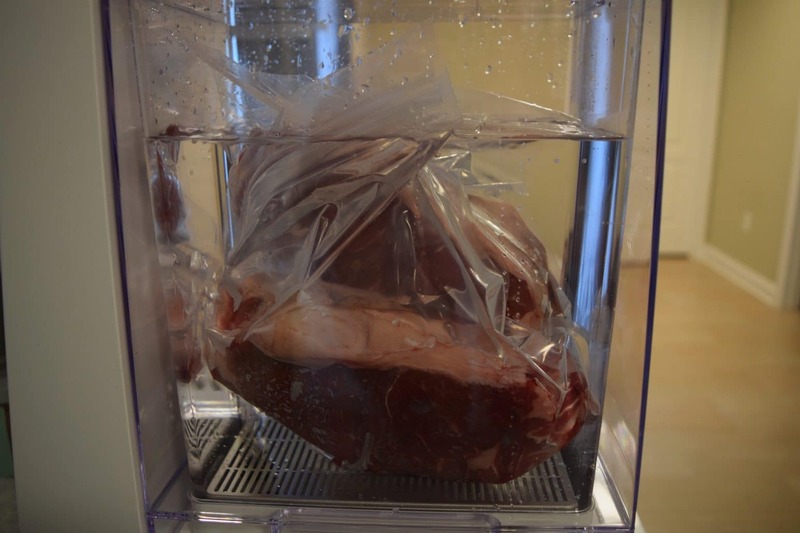 After the meat came up to close to room temperature, I placed them individually into two of the bags included with the Mellow sous vide machine. I then added water to the tank until the midpoint between the minimum and maximum line. As soon as I placed the water tank back onto the weight sensor, my phone received a notification that weight had been detected. I added the steaks to the water bath, checked to make sure the water didn’t encroach past the maximum line, and then set the necessary settings on my phone. 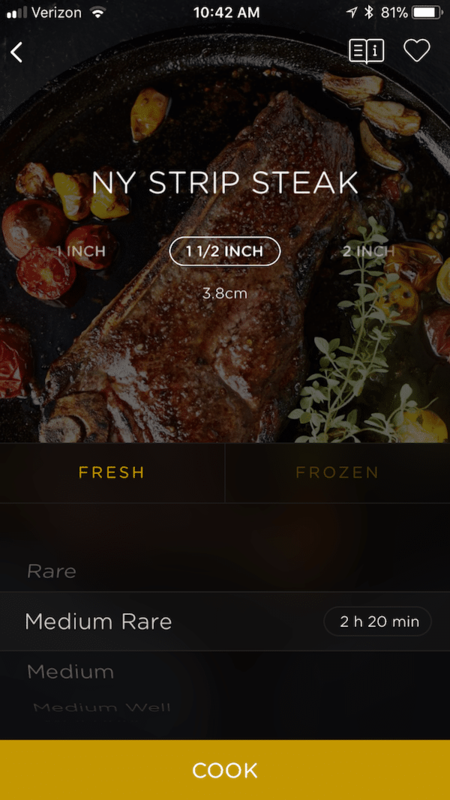 I was then able to select what type of food was in the tank (beef) and then drill down to select what type of beef (New York Strip steak). From there, I could select if the steak was fresh or frozen (it was fresh), and how I would like it cooked (I chose medium rare, because I’m not a heathen). Once these selections had been made, I was asked to choose when I wanted the steak to be ready. As can be seen by the above screenshots, it was about 10:45 in the morning. I wanted the steaks ready to sear with a torch at 4:00pm, but apparently, the cook time was only two hours and 20 minutes. I set it to 4:00pm to see what would happen. The bubbles began to emanate from the base of the tank, and within a very short period, I checked the stats on my phone again to see that the temperature had actually dropped to the mid-40’s Fahrenheit. 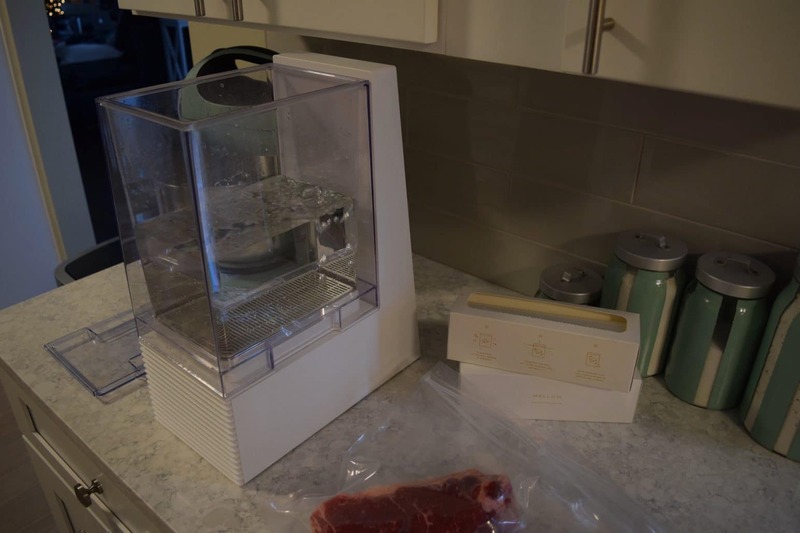 That’s right, the Mellow sous vide machine was keeping the water temperature cold enough to keep the steaks refrigerated for several hours while waiting for the optimal start time for cooking. I touched the outside of the tank to see how cold the water had become, and was surprised to feel nothing but room temperature, dry plastic. The double-walled design was incredibly effective at maintaining a steady temperature both at the inside layer and the outside wall. 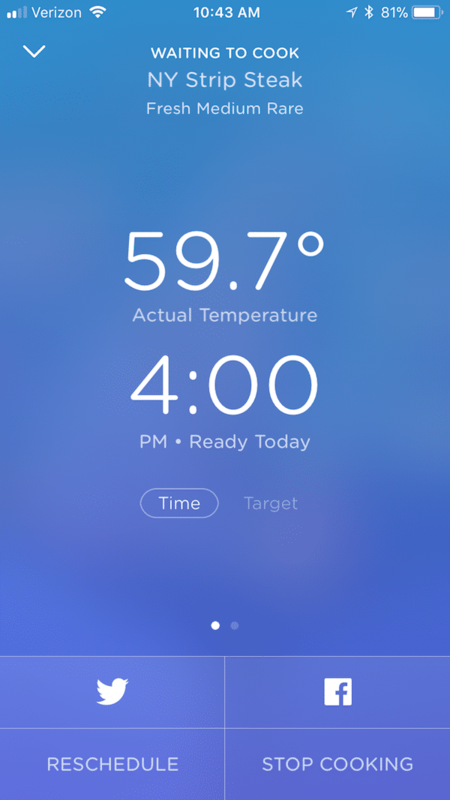 At approximately 1:50pm, the pressure of the bubbles in the machine changed slightly, and I checked my phone again, watching as the temperature slowly began to rise. 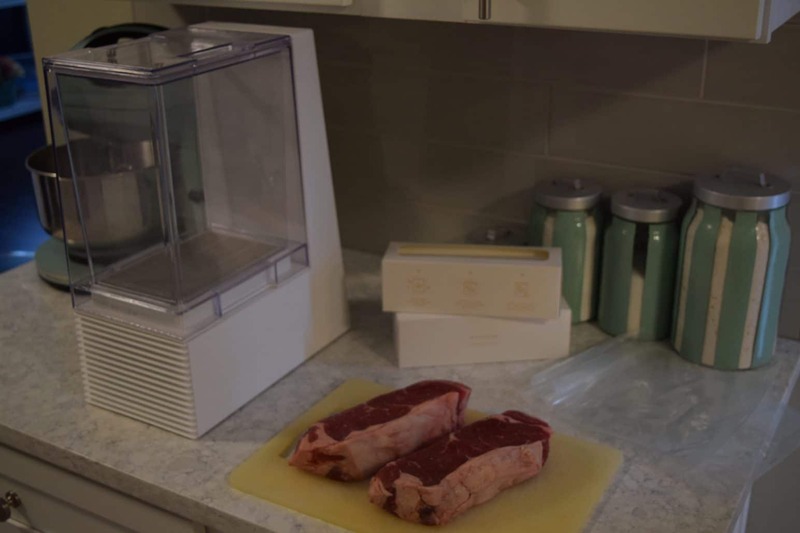 The most impressive thing to me about sous vide and the Mellow machine is that the steaks, once finished, could essentially sit in the hot water bath for hours upon hours without overcooking. Optimal temperature for a medium rare steak of this thickness is 131 degrees Fahrenheit. If the water never rises above that mark, the steak will never get warmer than the peak 131 degrees. Provided the water does not lower in temperature, the steak will also never drop below 131 degrees. 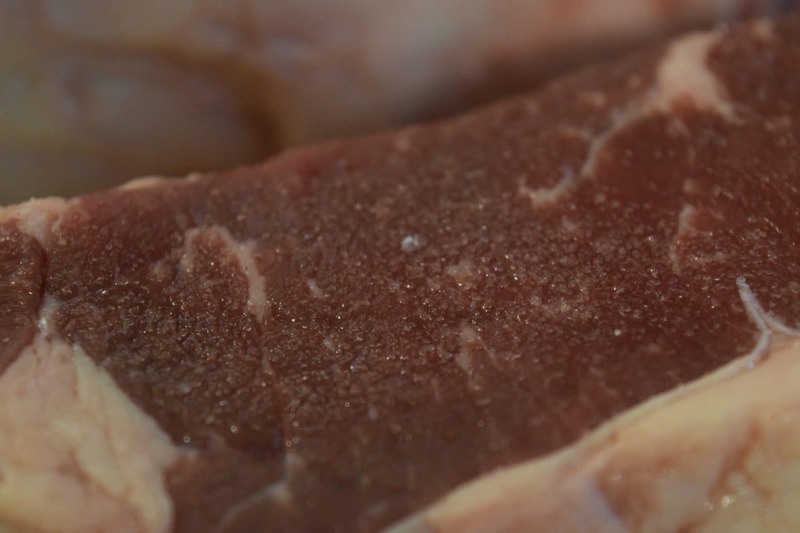 After about an hour, I checked on the steaks to see that they were turning an awful shade of greyish-pink. I was slightly concerned, but put my faith in Mellow to come through. At exactly 4:00 on the dot, I received a notification that the steaks were ready, and simultaneously the bubbles in the Mellow began to pulse rhythmically to notify that the meat was fully prepared. I received the option to remove the steaks from the bath, or leave them at temperature. This function will surely come in handy on days I am trying to perfectly time meal preparations, but find myself stuck in traffic on the way home from the office. I was impressed at Mellow’s timeliness. 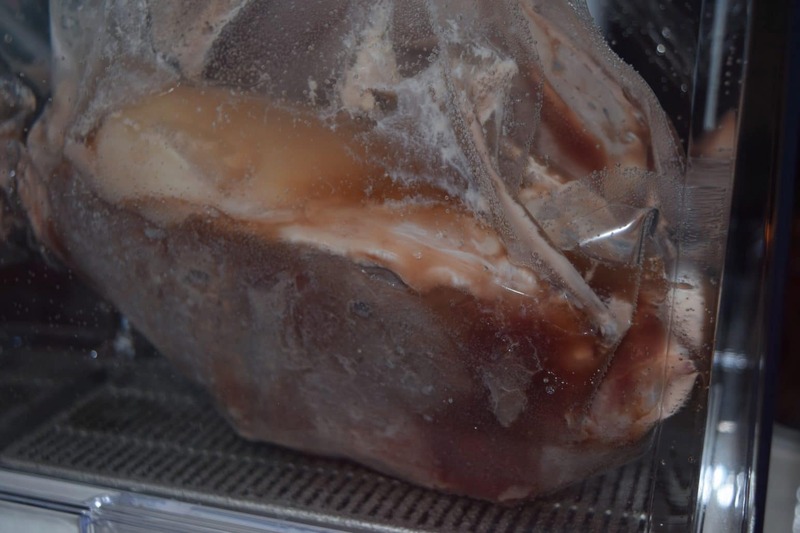 The meat was still that strange shade of greyish-pink. Luckily, ten minutes before they were ready, I had started heating a pan to a high temperature for a suggested quick sear on all sides. I threw a few tablespoons of Kerrygold butter into the pan and let it get to a bubbling consistency, and then slowly laid the steaks into the butter. 45 seconds on the top, 45 seconds on the bottom, and 45 seconds on the fat ribbon was all it took. The resulting combination looked like a beautiful, buttery crust of a fifty-dollar steak at your area’s fanciest restaurant. But the beautifully-seared outside drew no conclusions about the performance of the Mellow sous vide process. 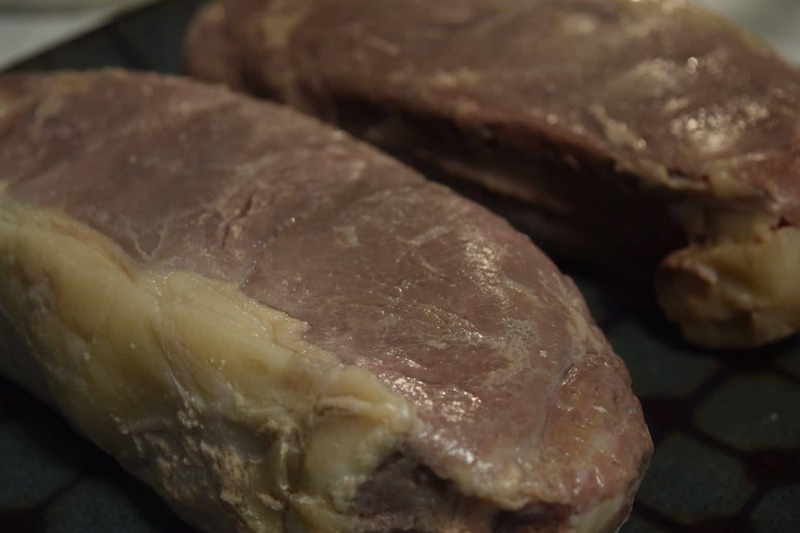 The machine could have all the bells and whistles imaginable, but if the inside of these tender New York Strips were raw or as grey as the outside of the meat was, I had just wasted several hours of time and twenty dollars in nice steak. After letting them rest for just a few minutes, I cut into the steaks to see what the final verdict would be. Imagine my surprise when I was looking at the most perfectly cooked medium-rare piece of meat I had ever seen. The taste rivaled steaks I had eaten at upscale restaurants in large cities, and even that of the infamous 1,800-degree seared Ruth’s Chris steak. I attribute all the success to the Mellow sous vide cooker. Cleanup was the simplest cleanup I had ever performed on a steak main course, and one of the simplest cleanups for all sous vide operations. I threw the bags out with the leftover steak juices and emptied the water from the tank. I gave the tank a quick rinse, and then placed it back on the Mellow base. That was it. Under 60 seconds start to finish. Since cooking the above beauties, I have also delved into pork chops sous vide (turned out wonderfully, just like the steaks) and a makeshift version of the Starbucks Sous Vide Egg Bites with the Mellow. The Mellow sous vide typically runs $399, but is on sale for $299 during December. Use code: SVWIZARD at checkout to get a box of 20 FREE Mellow Sous Vide Bags – https://www.cookmellow.com/. 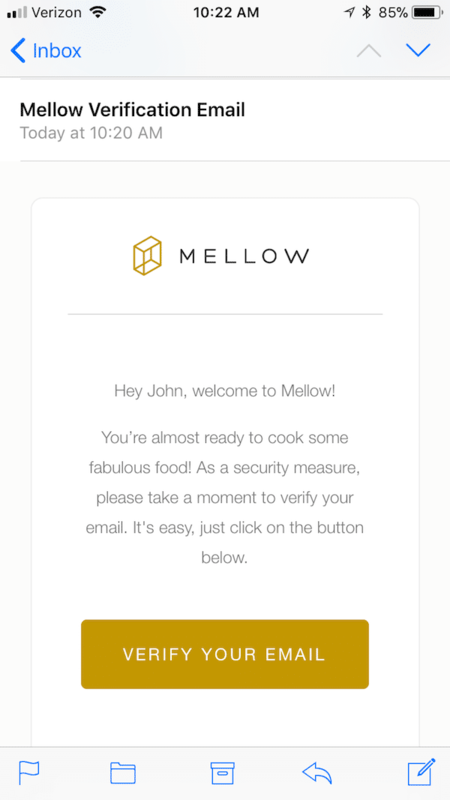 Editor’s note: we received a free unit from the Cook Mellow team in exchange for our review. this did not impact our thoughts on the product. I just received mine yesterday. Concerned though and maybe you can help. I seasoned and put in salmon with cold water about 80 minutes ago. It is in cooling mode. In those 80 minutes it’s only gone down about 10 degrees. Right now it sits at 47.9 degrees. This is still 10 degrees above my refrigerator temperature. Not due to start cooking for another 90 minutes. In that time (if it continues cooling at this rate) it’ll just barely be refrigerator temperature. Which means it won’t have been “chilled” for 3 hours. Apologies for the delay in responding; I was on holiday. I hope your salmon turned out well. Those temperatures are fine since the salmon was going to be cooking in only a couple of hours. and I’m winning two ways, quality and meet to desired taste. cooks all alike except the bells and whistles.